Iranian source claims meeting with UN envoy led to agreement on political solution to Syrian crisis. 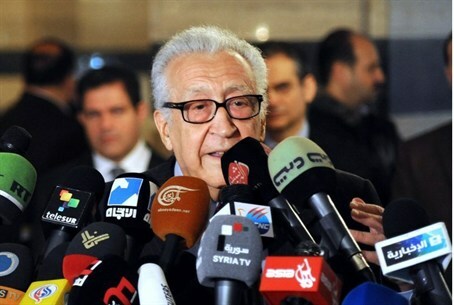 According to the Lebanese Al-Mayadeen television network, an aide to Iran’s Foreign Minister on Monday said that Iran and the UN envoy to Syria, Lakhdar Brahimi, have reached an agreement on a political solution to the crisis in Syria based on internationally supervised elections. Brahimi, who arrived in Damascus Tuesday, has been trying to arrange the "Geneva II" peace conference to deal with the Syrian issue, but until now has not achieved much success. In Tehran on October 26 Brahimi met with Iranian officials to discuss the Syrian crisis. According to Iranian sources, Brahimi proposed that Assad serve a figurehead role in a transitional government, a proposal Iran rejected stating that Assad should be able to participate in elections. The chances of resolving the conflict have been further lessened by the opposition's resistance to Geneva II unless its goal was Assad's removal. 19 joint Islamist rebel groups went as far as calling attendance of the talks treason. In an interview with Jeune Afrique, Brahimi said "many of those around [Assad] believe his candidacy [for a new presidential term in 2014] is a fact. He considers this an absolute right... He thinks above all of completing his mandate." He went on to add, however, that "what history teaches us is that after a crisis like this there is no going back. President Assad could therefore usefully contribute to the transition." Regarding Geneva II, Brahimi said "this conference is the beginning of a process. We hope that the opposition will manage to agree on a credible and representative delegation."